Okay kiddos - let's bounce away from all the catch-ups and talk about my actual spoils from last actual week! 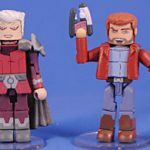 This set is a welcome surprise as it's only our third Animated Guardians set, and the first since Series 2 of these Walgreens exclusive Minimates! 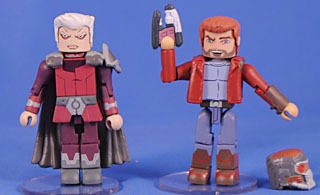 Star-Lord is neat, and pretty similar to the previous one with just some deco changes and a new facial expression. The color changes in the paint actually do make these two figures seem pretty different once they're side-by-side, and I'm not sure if those changes come from DST, Marvel or the cartoon. I would have preferred a new character (Yondu or Nebula, please!) but now this gives one the excuse to have both a helmet on and off version of Star-Lord. The real star here is The Collector who looks surprisingly cool! 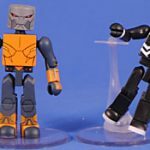 For what seems like such a basic costume it translates super well into the Minimates aesthetic and the different shades of gray and purple really make him feel more dynamic than it seems like he should be. I really dig this 'mate! What... the... heck... Such a weird, bland pairing ESPECIALLY after the Hasbro two-pack of the same characters has been and will be warming pegs till the end of time. Both figures are fine but neither is exciting which results in a fairly dull set. 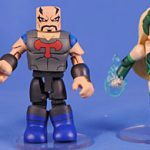 Skurge reuses the "bulky" body pieces fairly well, but the costume needs some more detail to feel interesting or dynamic. He comes with a big axe whose handle is too narrow to properly fit in Skurge's hand or support the blade's weight. It is cast in translucent red plastic so the blade-edges do have a kind of neat energy vibe to them. Enchrantress turned out well enough but I'm finding her hair piece SO back-heavy that she tends to fall over very easily. She comes with little translucent aqua-green energy effects for her hands. Overall this just strikes me as the weakest of ALL the Walgreens sets and I only got it to have a complete collection. 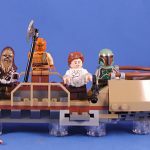 WHOA - this set is really cool! 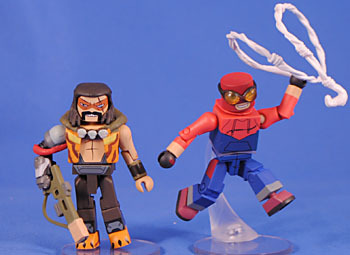 These last two sets in Walgreens' 9th (or 11th, to include the two bizarrely #.5 labeled series') series are from the latest version of a Spider-Man cartoon (as opposed those from Ultimate Spider-Man in the 7th and earlier series) and unlike the unappealing Minimates in the previous series from this new show, these are rockin' awesome! 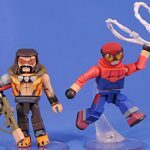 I've never liked Kraven, I kinda love this take on him - with a scarred face, dead left eye and what appears to be a bio-mechanical right arm! The design alone tells a story, and really sets the stage for a grudge-holding battle-worn hunter! He also comes with a pretty groovy looking gun too! And to face him is "homemade suit Spider-Man" which seems to run a really excellent riff on the sweatpants suit from Spider-Man Homecoming and really does look like something a kid could and would pull together from his closet. I especially love that he has removable goggles which are cast in translucent orange so that you can still clearly see his eyes through them. I kind of madly adore this set! Symbiote Spider-Man is more-or-less your basic Black Spidey variation, and while I'm not all that crazy about the white wristbands and shoe soles, and I dig this interpretation of the chest logo. It's large and more stylized look better sets up Venom's logo for me. And while that 'mate is neat it's the Hobgoblin that is gloriously awesome! This design takes the key colors and shapes of Hobby but mechanizes them to excellent results! He gets an all new hood piece (complete with dual antennae suggesting the classic goblin ears) with attached shoulder pads and back piece (implicitly a jetpack or something). I really love the design of the face/mask and the figure just looks so damn cool with hood on and everything! The latest Walgreens exclusive is yet another in a growing run of fantastic (pun!?) figures! This guy is basically a new head on a standard body but it's insane how unique he feels! A big part of that is this incredible silver paint they've found and used on him which is easily and by far the best silver paint I've ever seen on a toy! It seems almost vac-metallized in its brightness and sheen, but still has the nice flatness and not-afraid-to-leave-fingerprints-on-it-ness of paint - it's genuinely the perfect medium between chrome and paint, and it makes this figure incredible! 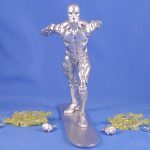 And let's not forget the articulation, which allows him to hit virtually every iconic Surfer pose - particularly thanks to THREE sets of hands! Plus, he gets two sets of Kirby effects for his wrists (which frustratingly STILL don't actually clip-on or stay in place) and a reused surfboard. 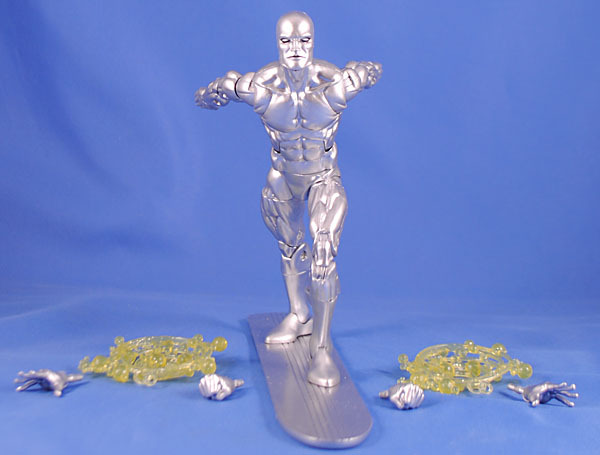 This guy is with out a doubt the single greatest Silver Surfer figures EVER released!!! I really, really wanted to love this figure but it's just a weird thing that sort of mish-mashes several different costumes together in one figure that is never really all that accurate. 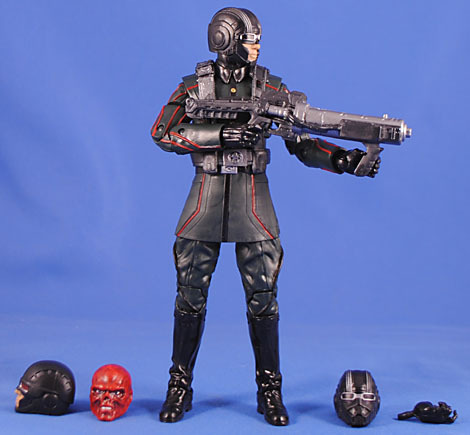 Like the original 4" figure, this Red Skull comes in a costume that I genuinely don't remember ever seeing him wear in the movie (so if he does, it's fleeting), but at least the SDCC exclusive version of him came in the black trenchcoat (I just haven't gotten around to opening that yet). 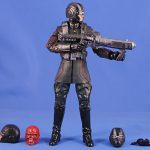 I imagine a big part of this choice was so that he could double as a battle builder, which I love... except from what I can tell each of these 4 heads all wear different costumes in the movie, so... We get the Red Skull head, of course (which bizarrely doesn't even look all that accurate), as well as a basic Hydra Soldier, and armored helmet Hydra solder and the helmet of a Hydra Pilot. They all look good (especially the pilot) but, again, based on what I'm seeing on Google Images, all wear different costumes. This guy comes with a removable harness/belt which is cool, one alternate hand and one of the energy guns from the movie. The gun is obscenely frustrating as its two handles are about twice as thick as the hands are sculpted to hold. And while his one alternate hand is wide enough to grab a handle, we only get one of those and for the left hand... just weird and SO frustrating! Why the hell would they design and sculpt an accessory than can't be held by the figure it comes with!? The idea of this figure is excellent, but the final execution is just frustrating. Niiiiiiice! I always love me some aliens, especially from the OT, so this Target exclusive is quite a welcome addition! It's weird that he's $30, which is $10 more than usual, but I'm guessing his bulk basically just demanded a new box/SKU. He's got all the articulation you've come to expect from SWB, including a jaw hinge, and most of the joints have a really good range of motion. Plus, he comes with three different weapons, so he is super primed to be a battle builder. His fur diaper looks surprisingly good all things considered, too. I just wish he had more/better paint, especially at this higher pricepoint. The face paint looks pretty blocky and rudimentary in person, and at least his torso could use a wash, if not his armor and skin as well. Oh well - Hasbro has trained us well to have low expectations. 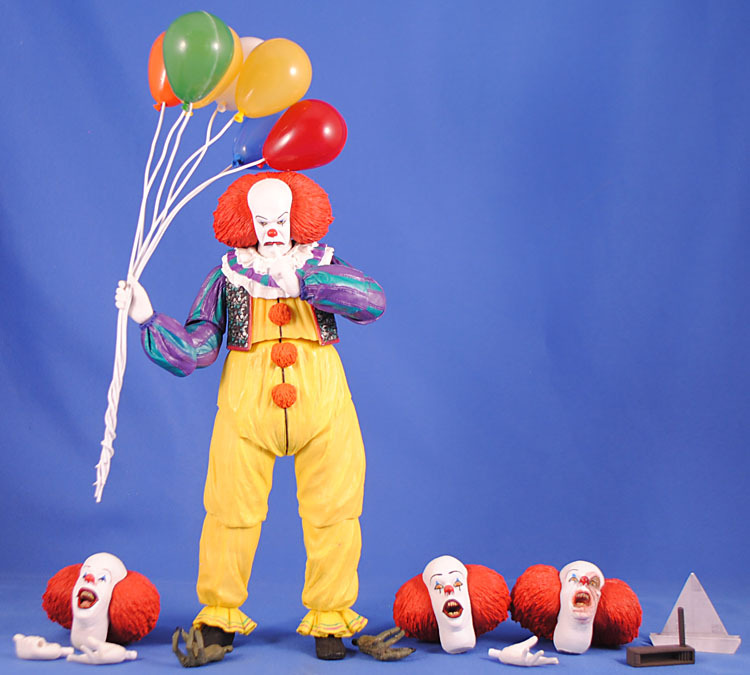 Some weird thing was up with NECA in 2017 where they barely put out any product (I think Randy indicated on twitter once that they were having factory troubles) so this 30th Anniversary set missed the actual anniversary, but all that matters is that it's out now and it's awesome! We get an "ultimate version" of Hero Ash with the new waist and upper legs from the Ultimate Evil Dead 2 Ash which replaces the thigh swivels and V-crotch of the original figures with now-standard ball-jointed hips. He comes with his sawed-off shotgun once again and the possessed mounted dear head (which sadly and annoyingly STILL doesn't have a peghole on the back to make for easy mounting) plus an all new Kandarian dagger and an amazing new Necronomicon with a hinged spine and printed pages! AMAZING!!! But that's not all... this Ash also gets two new heads! Both the Hero Ash and regular Ash figures came with the same "stunned" expression and while we get that head here as well there is also a "blank" expression head and an "angry" expression head! That is MOST welcome! Sadly, the skin tone doesn't quite match the previous figures so there is a subtle "off"-ness when they're on those, and these new likenesses are still just okay (a bummer given how amazing the Ash vs. 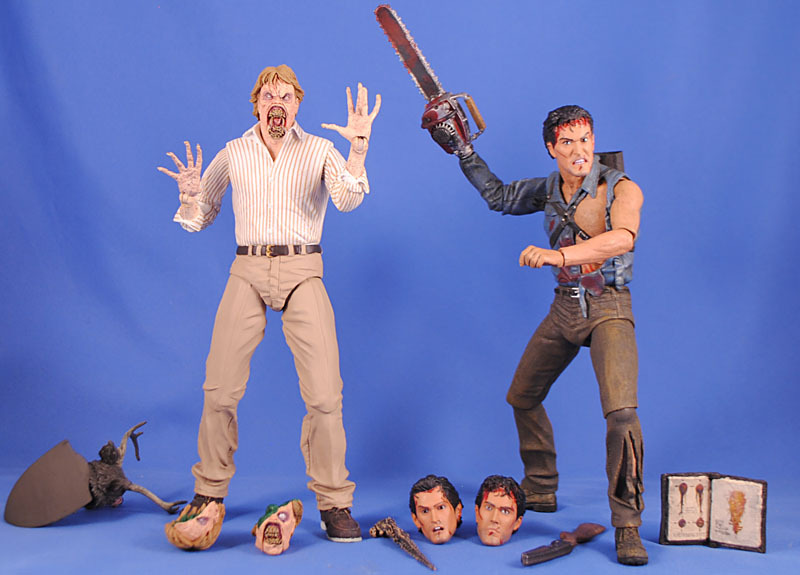 Evil Dead figures are) but it's still great to get some options! I'd really hoped that they'd also rework Hero Ash's arms to have the double-jointed elbows, but alas, no such luck. That's okay, though, because in lieu of new elbow articulation they went ahead and threw in a NEW FIGURE/CHARACTER!!! Evil Ed has been a fan request for a long time, and an unlikely option, but including him as part of a two-pack is a perfect solution! I expected him to be a re-use of the Carter Burke, or some other, figure but amazingly he appears to be an all new sculpt! (Well, maybe his calves are re-used from Carter but the thighs, waist and shoes are definitely different) Ed does get double jointed elbows, and they're the best/most functional of that joint yet, which allow him to hit his signature poses. The head is a great sculpt and even includes a hinged jaw - and as if that wasn't enough he also gets an alternate head (also with a hinged jaw) that separates to reveal his grisly death and evil shrunken green brain! This is a friggin' glorious set from NECA, and I really think I'm going to have to pick up a second (thanks to all the extra heads)! 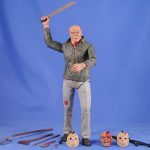 While I loved NECA's Nightmare on Elm Street series with a ton of Freddies, when they attempted a similar thing with Jason it didn't really click for me, partly because this is such a bland costume, so I was pretty excited when they announced they were re-issuing those figures, and doing new ones, in the "Ultimate" format. 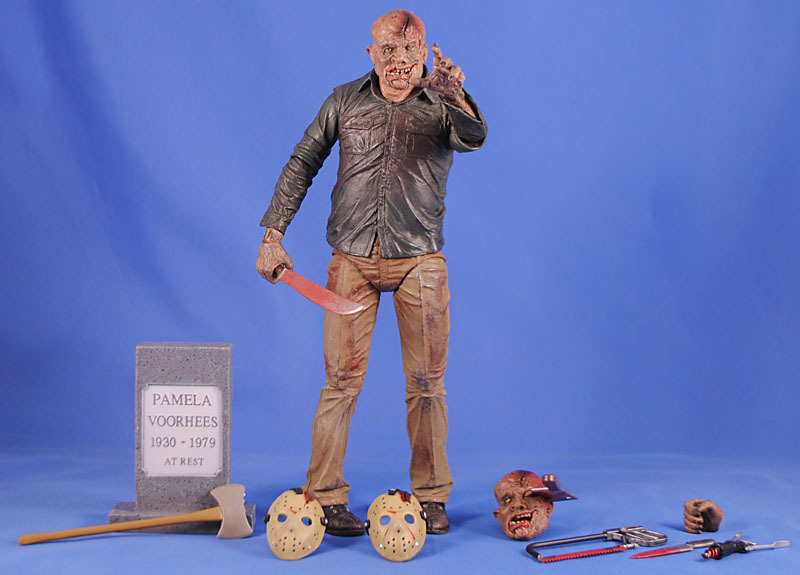 This Jason pulls together both heads and masks, and all the accessories (and maybe added a few more?) from the two single releases which makes for a wonderful release! I am tempted to get a second, due to the heads being significantly different from one another, but the reality is that this is a perfect figure to use with those head stands NECA released. 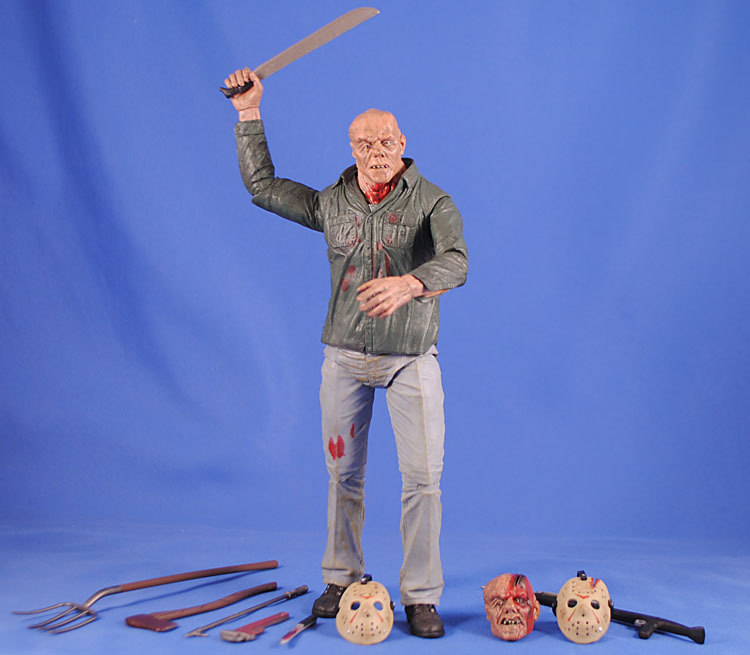 I am slightly tempted to get a second still, though, since I'd kind of like to display Jason unmasked since they went to the trouble of making the mask removable. I also really dig that the bloody head and mask have enough of a groove in them to fit the included axe blade in to it. It's a tight and shallow fit, though, so unfortunately the axe falls out easily, but it's a cool "look" none the less. I really just assumed this figure was a repaint of the Part 3 figure above, but only the waist down (and probably the torso under the shirt) are reused. That's really appreciated and helps add a big sense of value to the figure! This guy gets his Mommy's headstone and another eclectic variety of weapons, which are also all mostly unique to this figure! 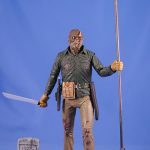 He gets two masks; one is the same sculpt as the bloody one from Part 3 while the other looks the same but subtly has a crack sculpted on from the split at the top down to the eye-hole. The real highlight for me, though, are the two heads which look properly monster-y and are awesomely detailed and beautiful! One even sports a battle damage gash that perfectly fits the meat cleaver accessory! Again, perfect for those head stands! I didn't expect to, but I'm really loving this figure! Now this is just a coooooool looking figure! And again looks totally unique but actually is the same from the waist down once more, though his calves are new here to include tattered cuffs. He's the least accessorized of the all the Ultimate Jasons but I'm okay with that given just how rad he looks. 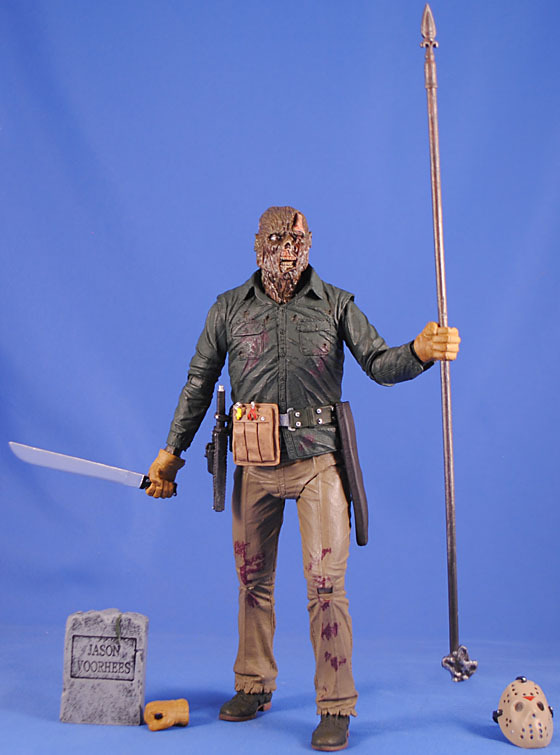 He comes with his own headstone, a machete, a hunting knife (both of which fit perfectly into sheaths on his belt), swappable right hands with varied grip to hold each weapon, a giant rod (which splits in the middle allowing you to get it into his hand) and, of course, a removable mask. I really, really love his corpse-y head/face and am finding it a real challenge to keep myself from getting doubles to have an unmasked collection on display too. 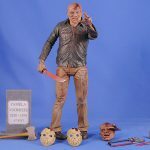 There's a Part 2 Jason out now and we've got a Part 5 "dream sequence" Jason coming next, they've confirmed a Roy, and have said several more figures are in the works so I really, really, really hope they do at least one Jason from every movie (I'm dying for an articulated Cyber Jason)! 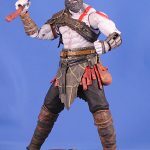 I will forever have a soft spot in my heart for Kratos figures as the original figure was NECA's first foray into full articulation on a figure, and it just looked wicked cool. Once NECA unveiled the upcoming two-pack at SDCC I knew I finally had to pull the trigger on getting this guy. I don't even know a videogames, but it appears they've moved Kratos north to cash in on the current Viking craze. The design is okay, but not quite as cool as the classic one. I've never really "gotten" the bald head + big beard look that's become so popular, but Kratos rocks it well enough here despite it making him look exactly like Tom Hardy to me for some reason. The paint is cool, especially for the skin - it turns out it's basically a heavy wash or drybrush of white paint on top of a dull maroon plastic which results in an amazingly realistic look. He comes with a Norse axe and a big gold shield. Interestingly the shield plugs into the gauntlet on the left forearm by removing one its metal tines. It's a neat solution to the age-old problem of how best to affix shield. Sadly, though, this figure has one major problem - gummy plastic for the legs and their joints. This means no matter how I pose him he topples over within five minutes. Cool. I was hoping getting this would hype me up for the two-pack, but instead it's cooled me on it. 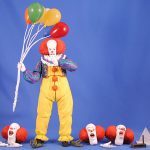 I was never a big fan of the original It TV movie, BUT I'll be damned if this isn't a gorgeous looking figure and, my god, the volume of accessories is mind-blowing! As I unpacked the figure and everything he comes with I kept thinking to myself, "my god, this is absolutely the Toy of the Year!" But sadly, that enthusiasm was short lived. He can barely remain standing due to really poor weight distribution in the torso and limited-range leg and foot articulation. While he comes with 4 interchangeable heads, the rim on the necks are too narrow and I could not for the life of me get any of the ones he wasn't packaged wearing on his neck joint - and indeed got a lot of paint rub on the neck of the one I tried the most. Friends have had luck with using boiling water or a hair dryer to soften the plastic, but as far as I'm concerned that's the same as saying, "this Ferrari drives great, as long as you put it in neutral and manually push it down a hill to get it started." Basically, it can't do the things it should do the easiest. The alternate heads are very cool, though, with genuinely amazing likenesses! Also, impressively, they even gave the scarred head a subtly different hair sculpt than the other three heads! 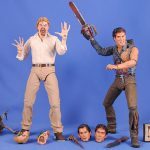 Man, NECA goes nuts with attention to details sometimes! I was also really excited for the balloons, but sadly the are super unwieldy and top-heavy, so even if you can pose their bendy wires well enough to both look natural and be held somewhat securely in the hand... the weight of them just causes the wrist to spin and flop endlessly (note that the balloons are being propped up by the head in my photo). The intent and appearance of this figure are incredible and flawless. However, production issues semi-"ruined" this figure for me, and while I had originally planned on getting 3 or 4 I've wound up so disappointed I'll probably just stick with the one. This entry was posted in Rustin's Spoils of the Week and tagged Captain America, Evil Dead, Fantastic Four, Friday the 13th, Guardians of the Galaxy, Spider-Man, Star Wars, Thor. Bookmark the permalink. Red Skull did wear that costume but it was mostly while he was wearing his disguise face. 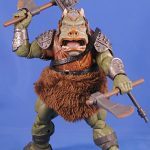 I'm annoyed Target doesn't have the Gamorrean Guard on its site as I can't find it in stores around me. Kratos is awesome. He's probably the most detailed figure I have! 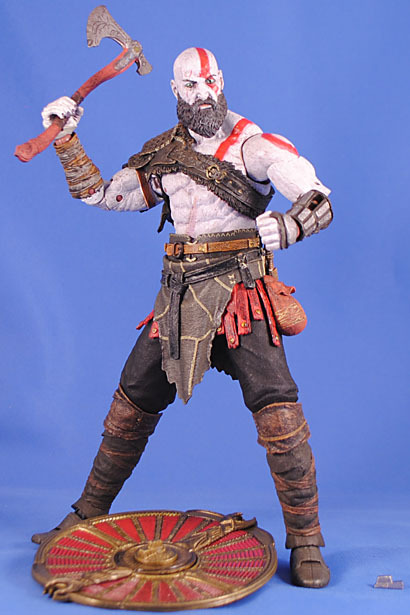 His knees are softer than I would like, but he can still stand and pose pretty well, better than any Neca Kratos before (he actually has ankle rockers!). And he just looks badass as heck just standing there holding his axe. I'm looking forward to the two-pack, the blades of chaos and the BOI look great! Just picked up the Evil Dead 2-pack, Ultimate Part III Jason and Ultimate Leatherface this week. 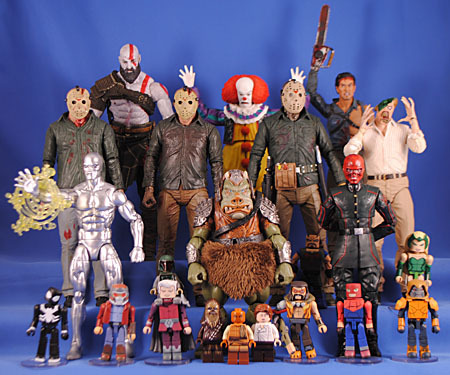 I need to pick up that Ultimate Part VI Jason too, it looks fantastic. 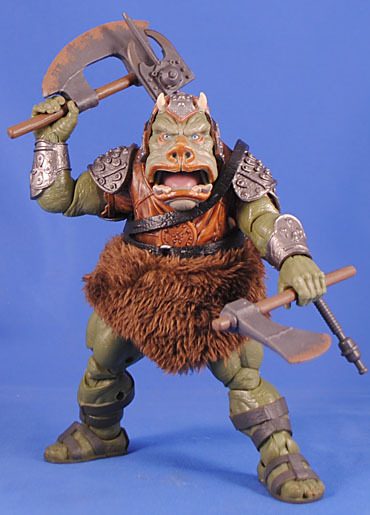 I have only one quibble with the Black Series Gamorrean Guard. The eyes are too far apart. On the original movie costumes, the masks used the performer's actual eyes so they were set only about an inch and a half apart and set very deep in the face. Too difficult to sculpt and cast?